For clients that cannot attend the inspection, or when demonstration of the findings is desired. There’s no waiting for the report! Immediately upon completing the inspection, the report is printed on site and given to you in a binder. We’re a 4-person team, ready to respond quickly to your inspection needs with ASHI Certified Home Inspections. We perform every inspection you may ever need; residential, commercial, termite, wind mitigation, pool – no matter what, we have you covered! We’re a 5-person team, ready to respond quickly to your inspection needs with ASHI Certified Home Inspections. MORE THAN 8000 PEOPLE HAVE TRUSTED US WITH THEIR HOME INSPECTION. seen it all and know exactly what to look for! EASY, DETAILED, REPORTS IN FORMATS THAT SERVE YOUR NEEDS. For a detailed inspection we are usually on site for 3 to 4 hours or longer, depending on the age and size of the home. You are encouraged to schedule the inspection at your convenience so you can be present during the process. This allows your questions to be answered while still at the inspection site as it is always better to see things through the inspector’s eyes. 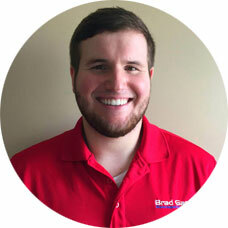 President, Brad Garey Home Inspections, Inc.
Jordan is an Afghanistan combat veteran, pursuing his Bachelor of Arts Business degree from Ohio Christian University. 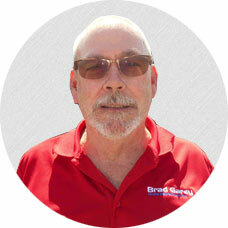 He came to Brad Garey Home Inspections with experience as a home remodeler and house flipper. He’s worked in construction, landscaping, and land surveying, but Jordan’s specialization is in understanding and analyzing slopes and grades for proper drainage or drainage problems. 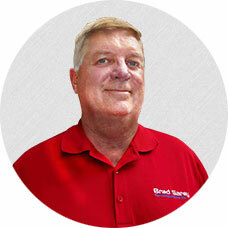 Moved to Pennsylvania in 1990 as a painting and remodeling contractor. In 1995, purchased the AmeriSpec Home Inspection franchise. Owned, operated, and managed AmeriSpec Home Inspection until 2011. In March of 1996, completed training at Amerispec corporate headquarters in California to become a certified home inspector. 2003 became a member of American Society of Home Inspector (ASHI) – the most recognized home inspection association in the country. Even assisting in the field on occasions! 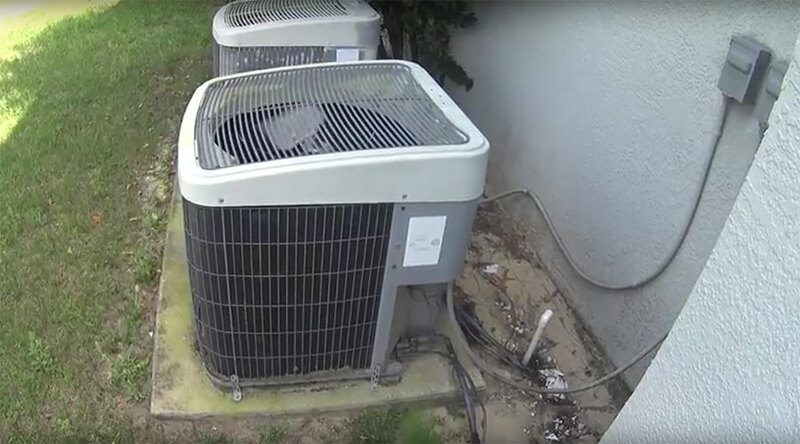 A residential home inspection will include a thorough inspection of your entire home structure, all of the systems that are located inside the home, and many of the items that are inside of the home (including many of the major appliances). A residential home inspection can be ordered either by the person selling the home or the person buying the home. Home sellers should have a home inspection completed so they will have time to have things fixed before selling the property and are not used against the seller in price negotiation. Buyers, on the other hand, are often required by lenders to have an inspection completed, but should order one regardless in order to know the exact condition of the property before spending any money. It is recommended that you be at the actual home inspection so you will know what exactly the home inspection report is talking about. Once we’re done, we’ll print the report and go over it with you so you understand every detail. If you are not able to attend, we can email you a detailed report stating all problems that were found. Before a commercial building is purchased, you want to make sure you know what condition it is in. If you are not sure what condition the building is really in, it is extremely important to get a commercial building inspection completed because it will focus on the condition of the property and how safe it is. Many builders are more worried about speed and deadlines and this often adversely affects the quality of the home being built. Additionally, the majority of new construction/phase tasks (e.g., foundation, framing, plumbing, and electrical systems) are subcontracted out to the lowest bidder. So, just because a home is newly constructed, it does not mean you shouldn’t have it inspected! While it’s required to have a building code inspector look at it, there are many things left out, making it extremely important to get a construction or phase inspection. Consider that each phase of the construction affects all the phases that follow it, so anything missed can cause a slow motion domino effect that you won’t notice until a couple of years into the house. By this time, your family’s safety could be compromised, your home value driven down, and it’s often too late to correct or reverse the problem without dramatic costs. You’re spending hundreds of thousands, if not millions, of dollars to build your dream home, spending a few hundred worth it to make sure it doesn’t turn into a nightmare house! An insurance inspection is a home or commercial property inspection that is completed by an insurance company. The inspection is done before the insurance company will cover the property because they want to protect themselves against costly payouts for things that might have been missed. For example, they are not going to want to put insurance on a piece of property where the electrical system might cause a fire or where the building structure could cause a collapse. Not all insurance companies are going to require a separate insurance inspection to be completed on the property. What they require varies greatly according to their policies and procedures. Not only are their requirements different, but insurance inspections themselves are not done in the same way. A termite inspection is completed to see if there is any evidence of termites in and/or around your home. Termites are wood-destroying insects that can literally destroy your home if not caught early and treated properly. Even if you live in a block construction home, which is very common in Tampa, there are still many wooden structures inside the house that are susceptible to termites. Depending on the size of your home, the inspection can typically take 30 to 90 minutes to complete. In that time, we are going to visually inspect the interior and exterior of your home. We’re going to inspect all scuttle holes and all attic access points as well as look for other types of wood destroying organisms (WDO), such as ants and carpenter bees. Our inspectors are not only looking for the insects that are destroying your home, but they are also trained in assessing the damage that has been caused. If WDO’s are found, it doesn’t necessarily mean that you need run from the property. If we do find termites or other wood-destroying organisms, we’ll will let you know the severity of the infestation and the recommend course of action. While termites are bad, they can often be dealt with pretty easily and efficiently if you catch them early. After the termite inspection is completed, the form will list any places where any sights of termites have been found. If you live in Tampa, home inspectors know the importance of wind mitigation (also called a wind storm or high wind inspection). Because of the sheer volume of high winds, tropical storms, and near-miss hurricanes that hit so frequently (not just Tampa proper, but St. Petersburg, Clearwater, and all the surrounding areas), a wind mitigation inspection is vital to your safety and that of your property. Not to mention that if you have a wind mitigation inspection completed, you are also going to save a lot of money on your home insurance policy! We will examine all reinforcements on the outside of the property as well as the exterior shell of the property. Besides the main exterior shell of the property, to ensure your property can withstand a hurricane or high wind storm, we’ll also inspect the roof, roof decks, tie-downs, and the protection systems for doors and windows. If your property has a poor structure and/or roof, it is going to make your property vulnerable to wind damage. So when inspection is completed, we will detail all parts of the property that are going to be vulnerable so you can have them addressed before the next storm (which, in the summer, seems like every day at 4pm in the bay area!). HAVE QUESTIONS? CLICK HERE TO READ OUR FAQ! Why do I need an inspection? If you were going to purchase a $50,000.00 automobile, you would test drive it first; right? So why would you spend hundreds of thousands or even millions of dollars on your new home or building without knowing it’s condition? The purchase of your new home, or place to operate your business, is probably the largest single investment you will ever make. You should learn as much as you can about the condition of the property, and the need for any major repairs before you buy, so that you can minimize unpleasant surprises and difficulties afterwards. No home is perfect, however, a professional inspector will also point out the positive aspects, as well as the maintenance that will be necessary to keep it in good shape. After the inspection, you will have a much clearer understanding of the property you are about to purchase, and will be able to make a confident buying decision. A commercial inspection will reveal the current condition of the structure as well as projected life expectancies of the major systems of the building. This will help you determine if the building you are considering is the correct choice for your new business endeavor. The best decision is a well-educated decision. Can I do it myself? Yes, however even the most experienced home or business owner lacks the knowledge and expertise of a professional inspector who has inspected hundreds, perhaps thousands, of buildings in his or her career. An inspector is familiar with all the elements of building construction, their proper installation, and maintenance. He or she understands how the home’s systems and components are intended to function together, as well as how and why they may fail. Above all, most buyers find it very difficult to remain completely objective and unemotional about the home or building they really want, and this may affect their judgment. For the most accurate picture, it is best to obtain an impartial third party opinion by an expert in the field of inspections. Can a home of building fail an inspection? No. A professional inspection is an examination of the current condition of your prospective home or business. It is not an appraisal, which determines market value, or a municipal inspection, which verifies local code compliance. An inspector, therefore, will not pass or fail a home or building, but rather describe its physical condition, list what may need repair or replacement, or estimate projected life spans of existing systems. When do I call a home inspector? An inspector is typically called right after the contract or purchase agreement has been signed, and is often available within a few days. However, before you sign, be sure that there is an inspection clause in the contract, making your purchase obligation contingent upon the findings of a professional inspection. This clause should specify the terms to which both the buyer and seller are obligated. Your Real Estate professional should assist you with this process. How do I find a qualified inspector? The best source is a friend, or perhaps a business acquaintance, who has been satisfied with, and can recommend, an inspector they have used. Real estate agents and Attorneys are also generally familiar with this service, and should be able to provide you with a list of names from which to choose. Whatever your referral source, be sure to ascertain the inspector’s professional certifications, and business ethics before you make your decision. You can do this by checking with the local consumer affairs office or Better Business Bureau, as well as by verifying the inspector’s membership in a reputable professional association. There are no licensing requirements for inspectors in many states! Please make certain that the inspector you select is a member of a professional association with a set of nationally recognized practice standards and code of ethics. This provides members with professional inspection guidelines, and prohibits them from engaging in any conflict of interest activities, which might compromise their objectivity, such as using the inspection as a means to obtain repair contracts. The association should also have rigorous membership and continuing education requirements to assure consumers of an inspector’s experience and technical qualifications. The inspector you select should also have passed the National Home Inspectors Exam, be properly insured, and have a list of references available. You can schedule your home inspection online or contact Brad Garey Home Inspections, Inc. at (727) 424-9078 to schedule an appointment. 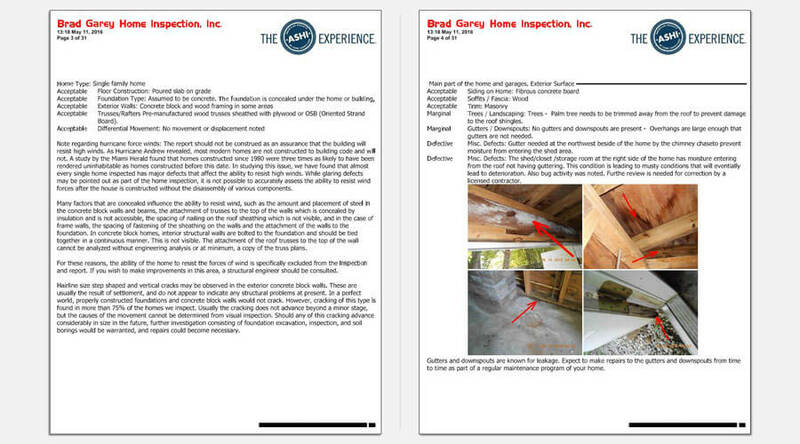 Once your inspection has been scheduled, your Real Estate agent, Attorney or Project Manager will need to arrange entry to the property with Brad Garey Home Inspections, Inc. Residential: The inspection fee for a typical single-family home varies geographically, as does the cost of housing. Similarly, within a given area, the inspection fee may vary depending upon the size of the home, its particular features, age and possible additional services, such as septic, well, or radon testing. 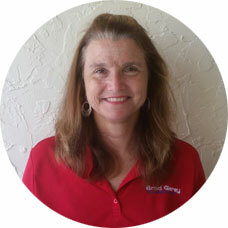 Please call Brad Garey Home Inspections, Inc. at 727.424.9078 for your quote. Commercial: Like the home inspection, a commercial inspection varies depending upon the type and size of the building. Other factors include the diversity of the inspection processes performed. The inspection can be as detailed as the client chooses, based upon his or her own comfort level with the building being inspected. Please do not let the cost of the inspection be the deciding factor. The knowledge gained from an inspection is well worth the cost, and the lowest priced inspector is not necessarily a bargain. The inspector’s certifications, training, and professional affiliations, should be the most important consideration. Do I have to be there? It is not necessary for you to be present for the inspection, but it is highly recommended. By interacting with the inspector, observing and asking questions, you will learn a great deal about the condition of the home or building, how its systems work, and how to maintain it. You will also find the written report easier to understand if you’ve seen the property first hand through the inspector’s eyes. What if the report reveals problems? No home or building is perfect. If the inspector finds problems, it doesn’t necessarily mean you shouldn’t proceed with the purchase, only that you will know in advance what to expect. A seller may be flexible with the purchase price or contract terms if major problems are found. If your budget is very tight, or if you don’t wish to become involved in future repair work, this information will be extremely important to you. American Society of Home Inspectors (ASHI) certification is the highest level certification a home inspector can achieve. Becoming an ASHI Certified Inspector means passing and maintaining the most rigorous requirements of any certifying body in all of North America. ASHI is a non-profit established in 1976 to establish and advocate high standards of practice and a strict code of ethics for home inspectors. They are recognized as the authoritative standard for professional home inspection to the point that many standards developed and set by ASHI are now part of many states’ legislation. Pass the National Home Inspector Examination and ASHI’s Standards and Ethics module. Had inspection reports successfully verified for compliance with ASHI’s Standards of Practice. Perform at least 250 validated home inspections that meet or exceed the ASHI Standards of Practice. Complete 20+ hours of continuing education per year in order to stay certified. We are so proud of and thankful for our Military, Fire, Police, & EMS Personnel. They put their lives in harm’s way everyday and we couldn’t imagine our lives and lifestyles without them. We thank you and offer a 10% discount off any of our services.